I’m watching the movie Mask of the Ninja starring my main man Casper van Dien and before that modern cinematic classic comes on I am treated to the trailer for this movie ‘Swamp Devil’. They kind of hooked me with that trailer alone, those crazy creature feature creators at RHI. Imagine a movie where Mr. Fantastic becomes an evil tree monster. Can’t beat that with a stick baby. Wasting very little time I secure me a copy of ‘Swamp Devil’ and watch me some ‘Swamp Devil’ and… talk about a let down. I’m not disappointed because ‘Swamp Devil’ was terrible because it really wasn’t. It wasn’t good either. It was just kind of there. Our film opens somewhere in the backwoods of somewhere in Canada stunt doubling for the American South. A posse is searching for a wayward girl in these woods who is being pursued by something unseen… something evil. Why she’s running around out here in these woods half naked is beyond us but there she goes. Sadly when our posse finds this girl she’s dead lying face up in a swamp. The locals however think they know who responsible for this murder and that would be super weird woodsman Howard Blaime (Bruce Dern) and now this armed posse has something else to do with their spare time. Somewhere on the other side of the country is Howard’s young, pretty, angst filled daughter Melanie (Cindy Sampson) who Howard sent away soon after her mother died suspiciously many a year ago. Melanie gets a strange call from some guy she went to school with back in the day named Jimmy (Nicholas Wright) who has informed Melanie that her dad is in trouble and needs her help. Reluctant at first, considering she hasn’t spoken to her dad since she was like twelve, Melanie jumps in her Geo and heads to Ontario! I mean Mississippi! Kidnie) is a little curious how news about her fathers plight reached Melanie and when the girl informed him that Jimmy told her, the Sheriff of this town of about fifteen people was curious as to who the hell Jimmy was. Sure enough Howard shows up spouting that monster nonsense, but more concerned as to why in the HELL is daughter is down there. Strangely enough he doesn’t know Jimmy either. He does know a tree monster when he sees one and THERE IT GOES! And it’s angry and psycho and wants to kill everybody. How does one go about the business of stopping the unstoppable? They might have addressed this in the movie, I’m not sure, but why didn’t we just set the damn thing on fire? I mean it’s obvious that bullets don’t work even though they continually shoot the damn thing and for all of you Smokey the Bear’s out there it is a swamp so I doubt the fire would go too far before dying out. Just a thought. But back to ‘Swamp Devil’ there really isn’t a lot to say. It is crafted competently enough, the acting is more than adequate for a movie about a killer shrub, the special effects and monster effects are about what you would expect from this kind of movie and while it does tend to get a little slow sometimes I’m guessing if you watch this it wont bore you to tears. I don’tknow if I’d call this a horror movie because it is never all that scary and director David Winning doesn’t seem to be all that interested in scaring you, and it certainly isn’t a thriller so I guess we’ll have just have to classify this a straight monster movie placed in the horticultural sub-genre. Aside from being just too darned mundane there are other problems with ‘Swamp Devil’ such as I don’t think we’re ever really told how this man-tree came to be. 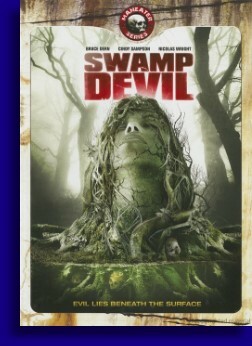 We do understand that this is a movie about killer vegetation and all but it does have a few lapses in logical structure here and there, but probably the most grievous misplay of ‘Swamp Devil’ is that the powers that be simply take this movie too damned seriously. When you see the trailer and observe a monster that looks like Gumby with branches shredding off of it you’re probably going into this thinking you’re in for some glorious silly fun. No sir, our filmmakers approached the subject matter of a photosynthetic Gumby like Kenneth Branaugh would approach ‘Richard III’. And we have to admit that this was a monster that was pretty damn difficult to take all that seriously. Again, ‘Swamp Devil’ isn’t terrible and it does seem to have been made by people who at least know what they’re doing, but it really could’ve used an injection of fun. Who would’ve thought a murderous Hibiscus could be such a downer?